The Mittleider Magic natural mineral nutrients are essential plant foods, mixed in a balanced formula to give your plants just what they need for fast and healthy growth. And the Micro-Nutrients are the part everyone else leaves out! This is the LYNCH PIN – the KEY to a great garden in any soil – get yours today, right here!! The micro-nutrients are ESSENTIAL PLANT NUTRIENTS, and every plant in your garden must have them to be healthy! 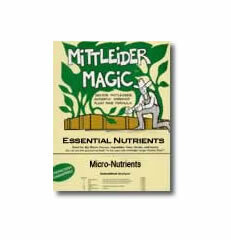 They are to be used as a part of the complete, balanced Mittleider Magic Weekly Feed Mix that is the best fertilizer for the family garden available anywhere. They are pre-packaged, so the only other things you have to buy are Epsom Salts at your pharmacy and a bag of 16-16-16 or similar N,P,K blend at your garden shop or nursery. Then mix according to the simple instructions, and you have a good Weekly Feed mix! And for a simple Pre-Plant mix, just add proper amounts of lime or gypsum, Epsom Salts, and 20 Mule Team Borax in a ratio of 80-4-1 (see Fertilizers in the Mittleider Gardening Course). Mix one 10 oz. package of Micro-Nutrients with 4 lbs. of Epsom Salt (Magnesium Sulfate) and 25 lbs. of 13-13-13, 15-15-15, or 16-16-16 to make your own Weekly-Feed. Do you live outside of Utah and Idaho (the pre-packaged Weekly Feed and Pre-Plant mixes are available in stores there)? Most people do, and shipping is expensive! The Micro-Mix is a good solution that will let you make your own Weekly Feed Mix easily and inexpensively, without the hassle of buying all 13 ingredients! We have had to increase the cost for the first time in several years, due to substantial increases in the price we pay for the raw materials. However, while not inconsequential, it is very small when compared to the value created in your garden. Like seeds, the return is multiplied many fold. For example, 20 ounces of Micro-Nutrients become 60 pounds of Weekly Feed when mixed according to instructions. This will feed 210 tomato plants for the entire growing season, and those plants can produce 2 1/2 to 3 TONS of tomatoes. Get YOUR supplies of natural mineral nutrients AND your heirloom seeds now!